It is also one of the most popular universities among graduate employers, one of the world’s greenest universities, and winner of the Times Higher Education Award for ‘Outstanding Contribution to Sustainable Development’. It is ranked in the UK's Top 10 and the World's Top 75 universities by the Shanghai Jiao Tong and the QS World Rankings. More than 90 per cent of research at The University of Nottingham is of international quality, according to the most recent Research Assessment Exercise. 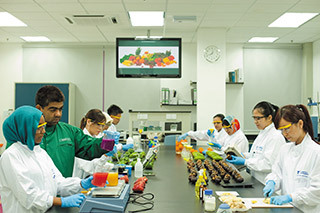 The University aims to be recognised around the world for its signature contributions, especially in global food security, energy and sustainability, and health. The University won a Queen’s Anniversary Prize for Higher and Further Education for its research into global food security. Impact: The Nottingham Campaign, its biggest ever fundraising campaign, will deliver the University’s vision to change lives, tackle global issues and shape the future. At Nottingham, it is about “getting an education” rather than “getting a degree”. This is what makes Nottingham unique and gives it what it refers to as the 'Nottingham Edge' - an unrivalled combination of quality and excellence, strength and pragmatism, enabled learning, boldness and innovation, respect and tolerance. The University aims to provide the best in UK education - innovative teaching and assessment methods. Our programmes encourage self-development, where you are encouraged to be independent, use initiative, and learn and explore new things. In effect we provide you with the tools to learn and develop your skills rather than simply training you to pass examinations and gain a degree. As a result, Nottingham graduates are equipped not only for the world of work as they leave university but also with the skills needed to go on developing in their careers in the future. Global thinking is an integral part of life at Nottingham in a way that sets it apart from most other universities. Study abroad is incorporated into many of its courses and all students are encouraged to think internationally. The student profile reflects Nottingham’s world-class status. On the University’s campuses, you will find people from many nationalities, cultures and educational backgrounds. In Malaysia, we currently have over 4500 students from more than 70 different countries - a stimulating diversity which adds even more to the enjoyment of student life. 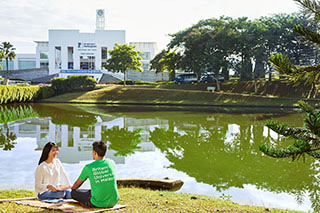 Programmes at the Malaysia Campus are identical to those offered at Nottingham after which degree certificates from The University of Nottingham are awarded, irrespective of whether the course was undertaken at Nottingham or Malaysia. 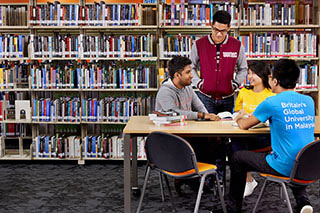 The Malaysia Campus offers the opportunity for an undergraduate to spend one or both semesters of the second year of study at their respective Schools in Nottingham, paying only Malaysia Campus tuition fee (provided the same programme is also offered at the campus in Nottingham). Eligibility is subject to a minimum academic performance and availability of places. The Malaysia Campus also allows transfer of degree studies to Nottingham, UK. Students who transfer to the UK will pay the UK International students fee. Eligibility is subject to a minimum academic performance and availability of places. Our degrees are accredited by professional bodies such as the Association of MBA’s, British Computer Society, Royal Pharmaceutical Society of Great Britain (RPSGB), and the UK Engineering Council which means that our programmes are tested for quality. Furthermore, the Malaysia Campus also has been recognised as part of the country’s higher education elite and has been granted the power to approve and accredit its own degree programmes, rather than having to apply for approval from the country’s higher education ministry. From an employer’s perspective, it is a guarantee of top talents. 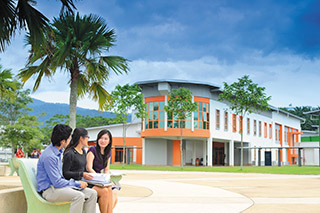 The Malaysia Campus offers state-of-the-art learning and teaching facilities. There is also a ‘Teaching Facility’ within the Kuala Lumpur city centre from where postgraduate programmes, including MBA, applied psychology, and education are delivered. All aspects of the students’ needs have been looked into. On campus, you will find facilities such as a bookshop, café, convenience store as well as the Students' Association building where the students’ recreational needs are catered for. The University provides a number of support mechanisms to help students such as a health centre, counselling, careers advisory, etc. The Malaysia Campus grants scholarships to deserving and academically excellent students in recognition of their achievements. Applicants are selected based on their academic achievements, leadership qualities and the socio-economic status of their family. Scholarships are offered for all programmes offered at foundation, undergraduate and postgraduate levels. Please refer to our website at www.nottingham.edu.my for more information. The CEO and Provost, Professor Graham Kendall, has overall responsibility for all academic and operational aspects of the Malaysia Campus. He was awarded with a bachelors degree in in Computation from The University of Manchester Institute of Science and Technology (UMIST), UK and received his PhD from The University of Nottingham (School of Computer Science) in 2000. He is a Fellow of the Operational Research Society. Before entering academia he spent almost 20 years in the IT industry, working for various companies (including the Co-operative Wholesale Society and Provincial Insurance). He is an Associate Editor for many international journals. He chairs the Steering Committee of the Multidisciplinary International Conference on Scheduling: Theory and Applications in addition to chairing several other international conferences in recent years. He has been a member of the program/technical committees of many international conferences since 2000. He has been awarded externally funded grants worth over £5.5M from the Engineering and Physical Sciences Research Council and commercial organisations. Based on his expertise, he is a director of Aptia Solutions Ltd.; a non-executive director of Event Map Ltd. and a director of Nottingham MyRIAD Solutions Sdn Bhd which is the commercialisation arm of UNMC. Professor Kendall’s research interests lie in Operational Research, Meta- and Hyper-Heuristics, Evolutionary Computation and Artificial Intelligence, with a specific interest in scheduling (particularly sports), timetabling, cutting and packing, rostering and routing and logistics. MEng (Hons) Mechatronic Engineering , Scholarship holders of the Chinese Independent Schools (UEC) Scholarship.
" I am so grateful to get sponsored by the scholarship to let me pursue my course in University of Nottingham Malaysia Campus. Mechatronic Engineering is basically a professional discipline which combines the knowledge in Electrical and Electronic as well as Mechanical Engineering. It provides the opportunity for me to obtain the most understandings in multi-disciplined, mechatronic related field as well as some business and management skills. The multi-cultural environment in this campus implicitly engages me into an international level.It definitely gives me the chance to well-equip myself before I graduate working in the tough and volatile environment outside. The lecturers here are all very experienced and able to guide us to obtain the self-learning skill so that be more aggressive in learning rather than just be apassive learner. I believe that it would benefit me when I go for post-study or work. I do really enjoy the campus facilities such as the sports complex and jogging track. I play badminton, basketball with my friends or jog and swim when I feel stressed. I also used to climb the nearby Broga Hill during weekend. I joined the Outdoor Club, Wall Street Society and Robotic Club. It enrich my university life! " I believe the course offered by UoN was unique in that very often, the materials taught in the classroom was not limited to theoretical concepts but as students, we were encouraged to question these concepts and their applicability to the real world. More than that, assignments and examinations required us to critically assess the subject content and apply them to real business situations, a skill which I found to be very helpful during my internship at Bank Negara Malaysia. Presently, I am pursuing a PhD in the area of Financial Economics while working as a Graduate Teaching Assistant in UoN. The delivery of the modules at UoN which encourages a lot of independent study and inquisition prepared me very well for a career in research. Doing research is not an easy task as it requires a lot of self-motivation and initiative which are values that have been regularly instilled in NUBS students. I chose my undergraduate and PHD studies at the University of Nottingham because of its first-class academic and social reputation as a leading UK university. The standard and quality of studies at the Malaysian Campus is excellent throughout all the programs. The staff and lecturers are also friendly and supportive. Studying at the University of Nottingham Malaysian Campus is the right and best decision that I have ever made. I do really enjoy this course. This course is not just about drugs and medicines but also professional skills. During the professional skill class, we learn how to communicate with people and how to express ourselves in front of many audiences through presentations. I am sure it is going to help me in my career as a pharmacist. The best part about my course is laboratory work. I do love practical, especially during dispensary work. I get to dispense lots of drugs and it feels as if I have become a real pharmacist. Nottingham’s pharmacy course has prepared me with all these opportunities. Nottingham is one of the best universities in the UK. I found the MSc IT programme more comprehensive and rewarding than my expectation. The University gives strong emphasis on research in the challenging and exciting fields of IT-Artificial Intelligence, image processing and wireless networking, just to name a few . I was looking for a Masters programme which will equip me with a solid base and updated knowledge for the ever changing field of IT. No doubt Nottingham is one of the best universities in the UK. I found the MSc IT programme more comprehensive and rewarding than my expectation. The University gives strong emphasis on research in the challenging and exciting fields of IT-Artificial Intelligence, image processing and wireless networking, just to name a few. University life is sometimes hard but the lecturers at UNiM are approachable and very helpful. I’m really enjoying myself here and I’m glad that I’m always learning new things here at UNiM. Studying at the University of Nottingham, Malaysia Campus, has proven not only to be a great academic experience but even more so a great cultural experience that I would not have been able to obtain, had I chosen to study in my home country. Malaysia offers an incredible cultural diversity that I can learn a lot from, as gaining knowledge about other cultures is very important in today’s international business world. UNiM is a world by itself. Having the opportunity to exploit my youth in such an institution gives me great confidence and a strong stepping stone to undertake all challenges that I may face in the future. 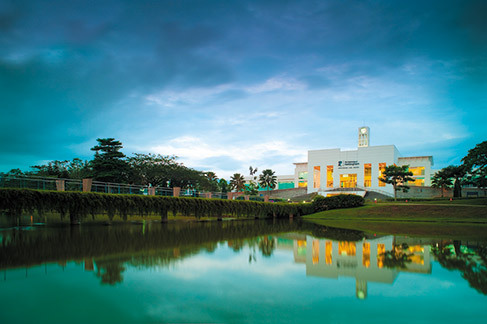 The University of Nottingham as usual has outdone itself with its campus in Malaysia. The Malaysia Campus has created the opportunity for students to attain excellent education. 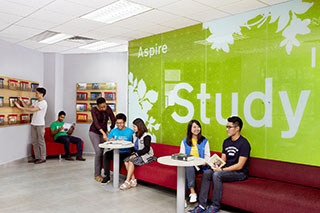 The campus itself has a unique and comfortable atmosphere, which encourages students and lecturers to interact freely. I enjoy the environmental part of my course most as it involves ways I can contribute towards a sustainable environment like recycling, reducing or reusing of waste, waste water treatment, energy efficiency and sustainability, environmental impact assessment, etc. I have made some amazing friends for life and have enjoyed my time here more than I thought I would and I’m still enjoying the social activities that the student association in the university of Nottingham provides. I have a huge network with every opportunity that I could ask for. Currently, I am the president of the Association and I am loving it. The Chemical engineering department here is fantastic as well; the academics are responsive to feedback from us as students and are dedicated to teaching us all the better qualities of being both a chemical engineer and environmental engineer.